The Art Gallery Book Club meets every second month at the Gallery to discuss books, enjoy great art, and share a glass of wine and a bite to eat. Kicking off our 2019 gatherings, our book will be Bridge of Clay by Markus Zusak. Join us in the study room for a friendly and open discussion exploring this captivating novel. The Dunbar boys bring each other up in a house run by their own rules. A family of ramshackle tragedy – their mother is dead, their father has fled – they love and fight and learn to reckon with the adult world. It is Clay, the quiet one, who will build a bridge; for his family, for his past, for his sins. He’s building a bridge to transcend humanness. To survive. A miracle and nothing less. 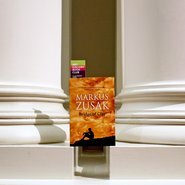 Markus Zusak, author of The Book Thief , makes his long-awaited return with a profoundly heartfelt and inventive novel about a family held together by stories, and a young life caught in the current: a boy in search of greatness, as a cure for a painful past. Bridge of Clay is available from the Gallery Shop. Buy your copy online.